Wednesday October 16th 1878 We were busy about the work all day. Mother went to town for groceries and I got the dinner. We had a big baking of bread in the afternoon and I baked four cakes. Mrs Prinney and Sade were here this afternoon. Weather pleasant. Thursday October 17th 1878 It was cold enough for winter this morning. I went to the valley with Rob. He took me on down to Aunt Libs. I had a pleasant days visit and got considerable knitting done. After supper the folks went up to Grandmas with me. I stayed there all night. 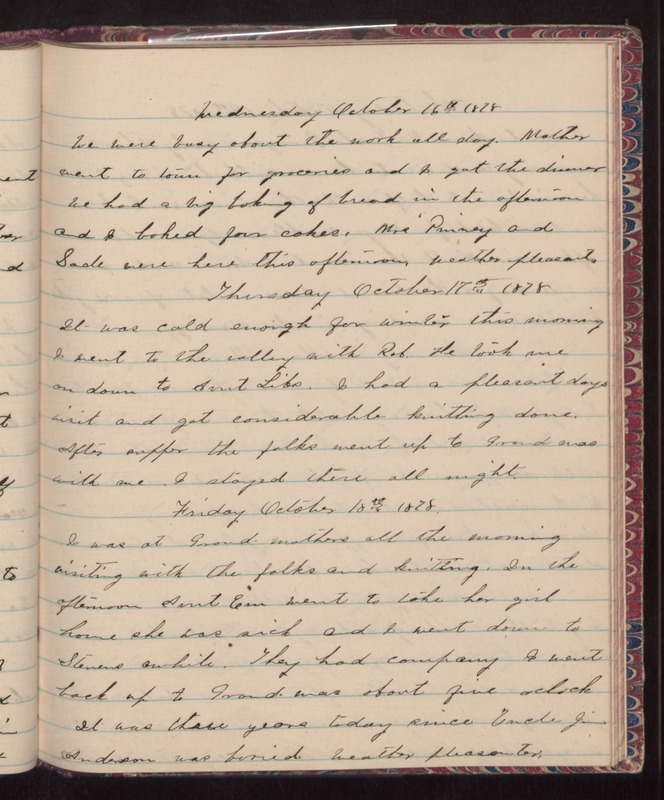 Friday October 18th 1878 I was at Grand-mothers all the morning visiting with the folks and knitting. In the afternoon Aunt Em went to take her girl home she was sick and I went down to Stevens awhile. They had company. I went back up to Grans-mas about five oclock. It was three years today since Uncle Jim Anderson was buried. Weather pleasanter.